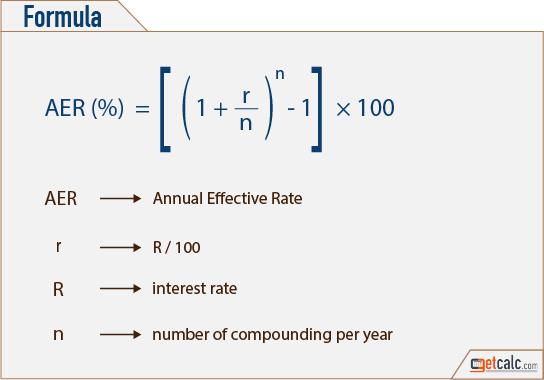 getcalc.com's Annual Effective Rate (AER) Calculator is an online finance tool to calculate effective annual interest rate for the preferred compounding frequency. AER is an acronym for Annual Effective Rate also known as annual equivalent rate, effective interest rate, effective rate or effective annual interest rate, a finance function or method used in the context of time value of money calculation, generally linked with compound interest, represents the ratio of total interest paid to the principal amount for a year, expressed in percentage. The increased compounding frequency with same interest rate accrues more interest amount.